Looking for something fun and different to do in the Lancaster area on Friday, May 20? 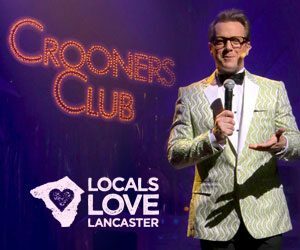 Then join us for our all new show Crooners during our “Locals Love Lancaster Night at AMT.” As a thank you to our nearby community, we’ll waive our normal ticket service fees for all local guests purchasing tickets to the 7:30pm show. Come see what our guests are raving about – Crooners, Friday, May 20 at 7:30pm – “Locals Love Lancaster Night at AMT,” with NO ticket service fees. If you’re in the Lancaster area and are looking for more fun activities, great restaurants, and super deals, check out Discover Lancaster’s “Locals Love Lancaster” options by clicking here. To redeem this offer, visit our Box Office, call us at 800-648-4102, or purchase online by clicking here. *Offer valid for Friday, May 20, 7:30pm performance of Crooners ONLY. New orders only; based on availability.